As city and volunteer cleanup crews descend on Anchorage's parks and trails for annual spring cleanups, there's a heightened awareness around used needles, symptoms of the state's opioid epidemic — and more efforts to provide special disposal containers to keep city workers and volunteers safe, officials said. For the first time, the state's largest needle exchange is providing 100 medical sharps containers to a big spring cleanup organized by the Anchorage Chamber of Commerce at the end of April. The cleanup involves thousands of volunteers who fan out into neighborhoods and pick up hundreds of tons of trash. Volunteers who sign up always get an orange trash bag, said Tosha Kelly, communications director for the chamber. But this year, the chamber will also hand out medical sharps containers donated by the Alaskan AIDS Assistance Association needle exchange program, known as Four A's. In the past, cleanup volunteers have been asked to use milk jugs, laundry detergent bottles or other puncture-proof, lidded containers as a receptacle for used needles, Kelly said. The chamber also directed volunteers to a flyer produced by the state of Alaska, outlining how to safely dispose of used syringes, Kelly said. The instructions include picking up the syringe carefully, wearing gloves and only using pliers and tongs if you can get a reliable grip, and never breaking the needle off or trying to re-cap the needle. Kelly said the donated medical sharps containers are a more proactive approach to making sure volunteers have the right gear. Meanwhile, the city health department this week donated 50 similar containers to city cleanup crews staffed by the parks and recreation department. Used needles aren't a new part of the city's staffed cleanup efforts and there is no way to quantify whether crews have been finding more in recent years. For at least a decade, city parks officials have been providing the plastic needle containers to staff cleanup crews, as well as training and personal protective gear, said Josh Durand, the city park superintendent. But in 2017, Gov. Bill Walker declared an opioid public health crisis, and growing resources and attention have been dedicated to the crisis. Shannon Kuhn, a spokeswoman for the city health department, said health officials wanted to play a bigger role this year. "From our perspective, it's a public safety concern," Kuhn said. "We wanted to help provide the sharps containers and keep the needles out of the landfill." There isn't data on the number of syringes collected annually from parks and greenbelts by the city, though Kuhn said health officials hoped to start tracking that more closely. Durand said the parks department had ordered the containers directly in the past, and officials were grateful for help from the health department this year. 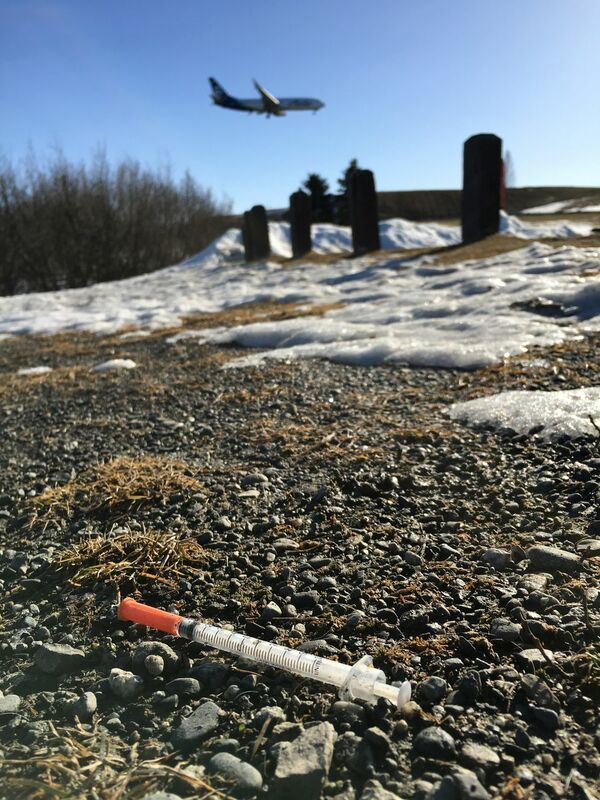 In general, Durand said, used syringes aren't widespread in Anchorage's parks and greenbelts. "Anchorage collectively is not plagued by this," Durand said. But there are certain parts of town where cleanup crews watch out for them, Durand said. He said hot spots come with illegal camps in public spaces, including along the Chester Creek Trail and in Mountain View. This summer, the city will train and deploy 10 employees to clean up illegal camps, a task that will likely include picking up used needles, Durand said. People serving court-ordered community work service also receive the training and the gear. The workers use trash grabbers to avoid picking up needles or other biohazards directly, Durand said. He said he was not aware of an instance where a city worker or volunteer was pricked by a used needle. Durand said the city does not plan to provide containers and training directly to volunteers, citing concerns about liability. At the end of the day, needles recovered by the workers go into large receptacles. Then the city takes the needles to the syringe exchange run by the Alaskan AIDS Assistance Association office on Fireweed Lane, Durand said. The exchange works with a contractor to incinerate the needles. Matt Allen, the HIV prevention and education coordinator for the needle exchange, said calls about used syringes in neighborhoods usually rise in the spring. This year, Allen said Four A's made the decision to order 100 containers to donate to the Anchorage Chamber of Commerce communitywide cleanup. The containers only cost the agency about $1 to order, and can also be purchased at most pharmacies, Allen said. Allen said the donation is part of the organization's mission to reduce exposure to HIV and hepatitis C.
"Harm reduction in general is just recognizing that there is a problem," Allen said. "And it extends to this." Want to know what to do if you find a used syringe outside? Read this flier from the state of Alaska.